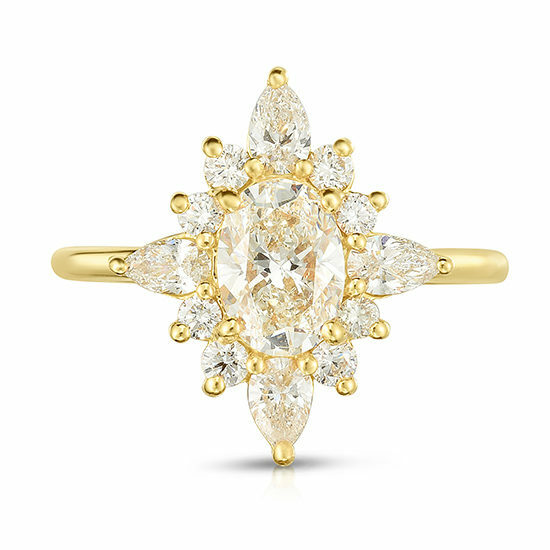 A contemporary take on a classic diamond cluster ring or ‘cocktail ring’. Our designer, Douglas Elliott, was inspired by Retro jewelry motifs and created this ring modeled after the classic ‘right hand ring’ that was popular in the ‘50s and ‘60s. Douglas updated the ‘big’ look of the classic cluster ring by lowering the stance of the diamonds so that they lay extremely low to the finger and he sharply reduced the amount of metal used in the design by using design technology not available in the past to create a thoroughly contemporary, refined ring that embodies a classic look. Shown in 18k yellow gold with a center 0.76 carat H color VVS2 clarity Oval cut Diamond, surrounded by four 0.37 carat pear shape diamonds and eight 0.16 carat round brilliant cut diamonds.